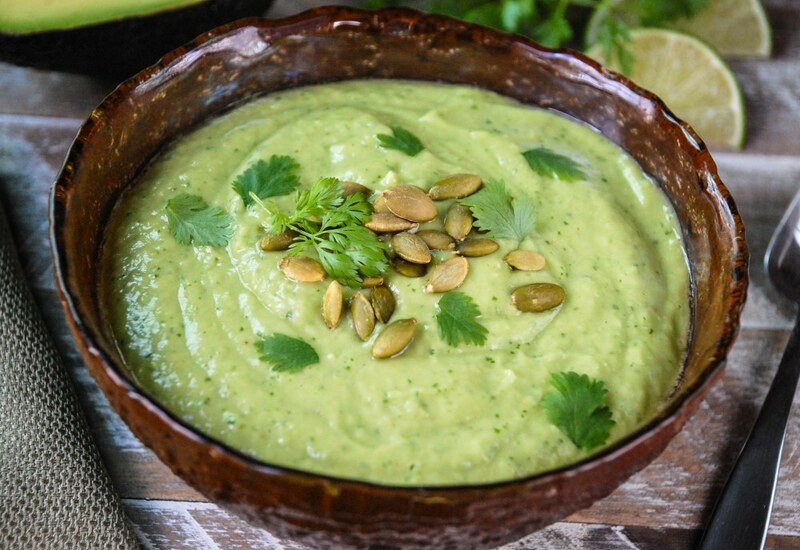 If you're a fan of guacamole, you've got to try this refreshing soup! Perfect for summertime gatherings or hot days, this lightly spiced, chilled soup really lets the avocado and cucumber flavors shine through. It's ready in minutes with the help of a blender. Full-fat coconut milk and lime juice accent the vegetables and make for a creamy base with just a hint of acid. Don't forget the toasted pepitas—they provide a delicious contrast in texture to the velvety-smooth soup. You could also try it with crumbled tortilla chips or fried tortilla strips! Toasting whole cumin seeds and grinding them just before use will yield a much stronger flavor in the soup. Try it out if you have fresh cumin seeds on hand! Alternatively, use two cups of plain yogurt in place of the coconut milk for a little added tang. Per Serving: 426 calories; 41g fat; 17.0g carbohydrates; 7g protein; 0mg cholesterol; 555mg sodium. I love avocado, so I'm partially biased to this soup, but it's fantastic. The cumin and coconut milk are my favorite flavors, and they work nicely in this dish. If you like avocado, you will love this chilled soup. My wife and I love to make this for our day date picnics we go on at the beach. What an easy, light, and refreshing soup. I did not add the cumin as it isn’t a flavor we overly like. We did not have Pepita seeds - so used Sunflower seeds. It is VERY filling soup. It doesn’t not save well, so needs to be consumed the same day. Great for warm summer days!